At 35 in. overall, it's the perfect length to deliver devastating blows at medium to short range. Each stainless steel spike is removable if you'd like to transform your mace into a wrecking ball club. The handle is wrapped in leather for a firm grip and it offers a skull crusher pommel for an alternative defense use. 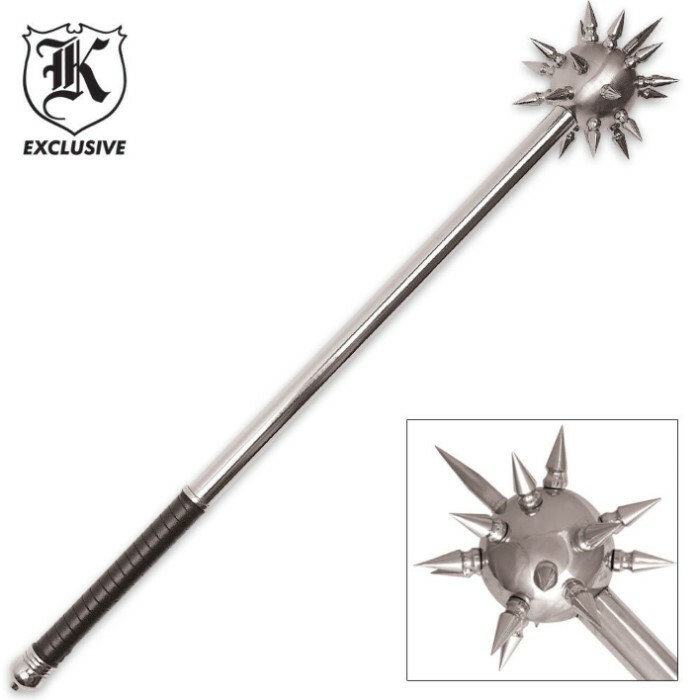 Looks good and the spikes would pierce a skull with ease. Did an excellent job on a couple of canalopes. Yes the head and shaft were hollow. Shaft is steel. Don't use it on wood. 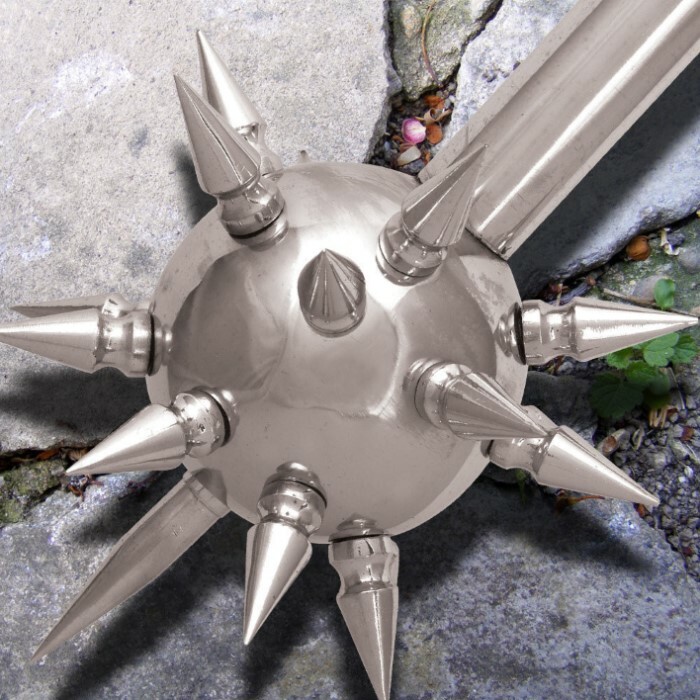 Spikes seem to be pot metal with chrome. Very sharp though. Have issues with 3 of them not screwing in. Too much flash in the threads. As imsaid mine WAS hollow. Filled it with kitty litter. Added about 3.5 pounds to it. Wish there were a way to get replacement spikes. Would be worth it. I purchased this for my father he was extremely happy with it it came durable and battle ready thanks budk!!! No devastating blows will be dealt with this poor excuse of a weapon, the rod is super thin metal and already rusted on the inside when I got it. How do I know what the inside looks like you might ask... Well that would be because the head fell off hitting a cardboard box. Coltan must work for the website to have left a review like that lol. Good ONLY FOR DISPLAY and should not be advertised as usable in any way. DONT BUY IT! Save your money, just get a baseball bat. The head on it does not stay on it just flies off everytime you swing it. The handle is hollow and this is very light. True, breaking through a door would destroy this thing and there are fit and finish issues. However, this thing would be very devastating to a human body, and it is lightweight enough to be used by a teenage girl. For the price, you can't beat the intimidation factor and true danger of this self defense weapon. When my daughter goes to college, she will have one in her room. BTW, if it is by your bed at night, don't accidently hit it with your foot. Extremely poor quality. The head came off on the first swing, and the handle crumpled like it was made of tin foil. EXTREMELY CHEAP MATERIALS STAY AWAY!!! Yeah, opened the box, its cheap. Well I have a gun show coming up, and they were 2 for the price of 1. I may be able to get out from under there. I think someone should have taken the time to assemble the product before selling it. Thier were many of the spikes that were crooked and did not fit in the holes flush. So SORRY but I will NOT recommend this product to any of my friends. Although this mace is priced well it's quality lacks very much. First of all the wrecking ball is one solid piece it's two put together. Next I took a couple swings and the paint was chipping off the ball. The spikes would not go in so i had to tighten them in.The screws stripped having to put them in i would only recamand this for display the ball it's self is glued to the pole.